On Friday 25th of January, Chrystalla Petridou*, Programme Manager of DG EAC on Erasmus Plus, dropped by EfVET’s central office to discuss EfVET activities. 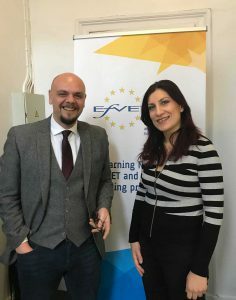 Panagiotis G. Anastassopoulos welcomed Ms Petridou in our premises and elaborated on EfVET’s new challenges and future. EfVET had the opportunity to discuss our position paper “A new generation of VET mobility programmes” on the Mobility Action in the Future programme and to present EfVET successful projects partnerships under the KA2 Strategic Partnerships Action and KA3’s.Ms Petridou showed a really active interest both for these and our future work. The Erasmus+ programme has benefited almost 800,000 people in 2017. 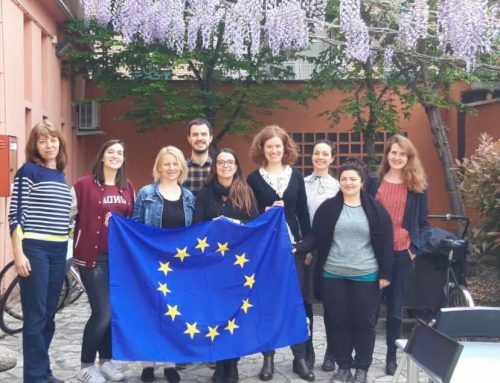 With a budget of almost EUR 2.6 billion, representing a 13% increase compared to 2016, Erasmus+ provided almost 800 000 people with an opportunity to benefit from learning, working or volunteering abroad, 10% more than the year before, explained Ms Petridou. EfVET invited Ms Petridou to come to EfVET future multiplier events in Brussels and elaborate on the existing and future situation on Erasmus+. It was a short but fruitful meeting with views being exchanged on common fields where EfVET’s members are active. The meeting ended with mutual commitment on closer communication in the near future. *: Chrystalla Petridou is working as a Programme Manager at the European Commission. Currently she works in the unit “Schools and Multilingualism” in Directorate General for Education, Youth, Sports and Culture (DG EAC). Her main responsibilities is to monitor and support the implementation of the Erasmus+ programme in the field of vocational education and training in line with EU education policy priorities. She is currently chairing the VET Mobility Working group, comprised by National Agencies’ representatives working in Key Action 1. Before coming to the Commission she worked as an Attachée at the Cyprus Permanent Representation and under this capacity, has been a member of the Education, Culture, Youth and Audio-visual Committees of the Council. Prior to this she has worked at the International and European Affairs Office at the Ministry of Education and Culture in Cyprus, as a policy officer and advisor in the field of Audiovisual during the Cypriot presidency of the Council of the EU.